August 19, 2013–The Tax Foundation prepares maps every Monday. They are neatly drawn. These maps seem focused on the single theme that taxes in America are just too darn high. 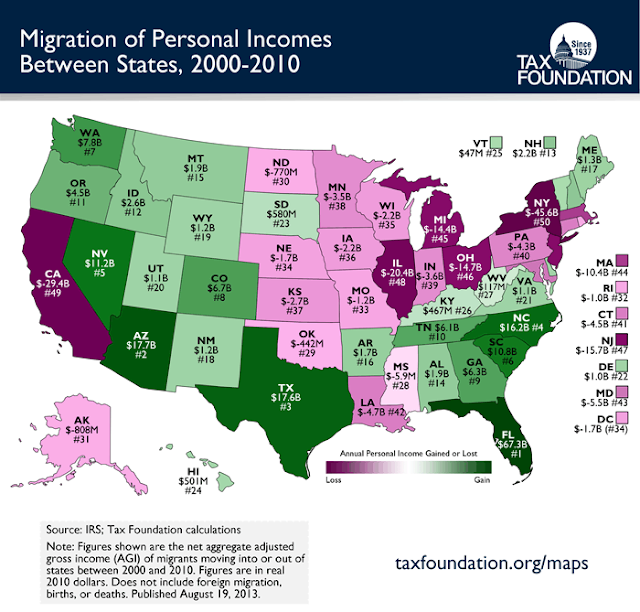 Today the Monday map shows the net "Personal Incomes" (Taxable Incomes - Adjusted Gross Incomes) of migrants moving from some states to other states between 2000 and 2010. The Tax Foundation press release says that the Foundation used its State Migration Calculator to calculate the net migration of taxpayers to and from each state. These taxpayer numbers are then apparently multiplied by dollar figures from IRS data. Since the IRS does not share individual data, the data must be based on samples of returns and aggregated state data. This exercise concludes that NY, CA, IL, NJ are the biggest losers of the personal incomes of people migrating from their borders. Similarly, FL, AZ and TX are the biggest winners. High-tax states are losing to low-tax states. Case closed? The big states are bound to be the big winners and losers in this game. It would be much more meaningful if percentages were used. Maybe some future Monday map? As people get older, they tend to retire to the south where physical survival is less arduous. The shift from rust belt to sun belt could be retirement driven, not tax-driven. Whatever their motivation, the Tax Foundation comes up with data worth pondering.